The Imperial bedroom was the most private and intimate room of the palace. It could only be entered after passing through the Pallisander Room and the Mauve Room. 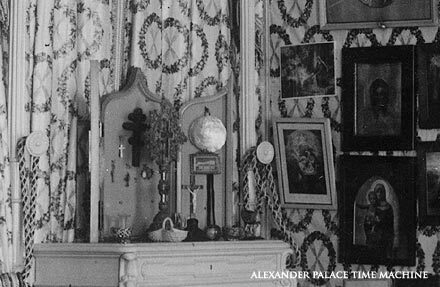 When Alexandra first saw this room, it had been untouched for more than twenty years. When their occupants were away, palace rooms were shut up with the furniture in canvas covers and the paintings covered in sheets. Small things were packed away in drawers or sent to storage. Sometimes the windows were covered with heavy shutters. Servants were assigned to dust and clean these rooms periodically but most of the time the rooms remained locked with the keys in the control of the palace marshal. 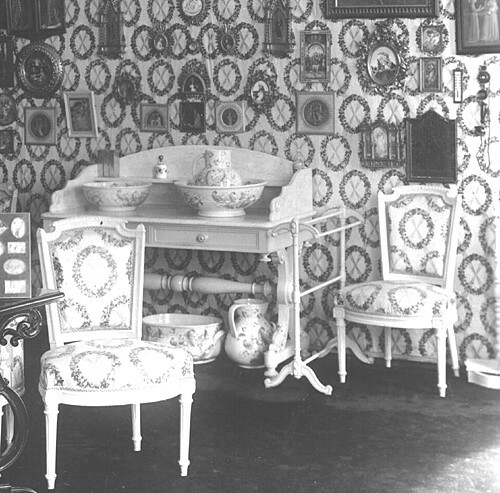 Alexandra may have been told that this room and the mauve room next door had connections to her family. In a strange twist of fate Alexandra's mother Alice had visited these rooms years before when she attended the wedding of her brother, the Duke. The room had been a part of a honeymoon suite that Alexander II had established in the palace for his daughter Maria when she married Alfred, Queen Victoria's son and the Duke of Edinburgh. Left: Detail of the curtains around the bed. After seeing the room and discussing it with her husband and the decorator Meltzer it was decided to leave this room much as it was. Alexandra liked the room and it seemed pointless to her to waste money - and time - on a complete redecoration when much of the furniture would still work. So, the 1870's furniture, which was made in Russia, was reused, although it was painted in a heavy coat of white enamel to lighten and make it cheerier. A great columned arcade which traversted the room from one side to another was also painted white, while the fabrics and floor coverings were replaced. Alexandra selected a shiny chintz print for the walls, upholstry and curtains. The pattern was of pink ribbons entwined with green wreaths set with flowers on a white background. 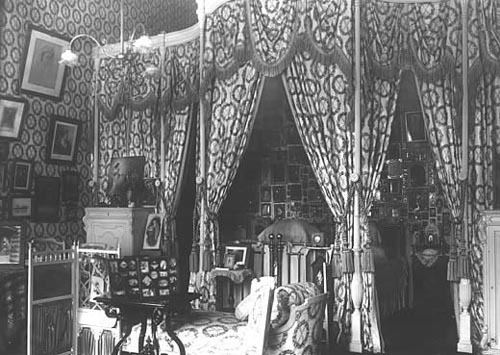 The effect of using the same fabric for an entire room had been used earlier in Russia at Gatchina Palace, however the effect here at the Alexander Palace was greater due to the colors and the effect of the trellis pattern. Kuchumov, the former director of the palace museum, said that the fabric gave the room a funereal feel, with the beds placed like a bier in front of the ikon wall. This was certainly not the Empress's intention. For her the room had the look of a bright English garden or a tent decorated for a June wedding. Curtains for the room were hung over the two large windows and matching drapes were hung between the columns of the arcade. Heavy cords with elaborate tassels were used to open and close the curtains. The back wall was hung with a light pink material which was pleated with a top drape. It matched the lining of the inside of the arcade curtains. The Imperial bed was made up of two gilt-bronze twin beds which were pushed together to make a large double bed. The top matress was covered in deerskin. The Empress's sheets were made of linen and cotton, carrying her monogram and a marking indicating that they belonged to her bedroom in the Alexander Palace. 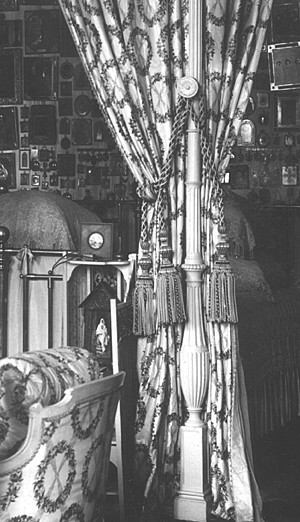 During the day the bed was draped in elaborate coverings of silk, lace and crochet piled with large pillows. At night they were made up with soft blankets and favorite pillows. The bed faced the window, behind it were hundreds of ikons and religious items which were hung on cords. Many of the ikons were ancient and valuable. The centerpiece was a large ikon of the Feodorovsky Mother of God - an ancient copy of the ikon used to bless the first Romanov Tsar when he accepted the throne. Other ikons were encased in silver covers (oklads) and covered in enamel and jewels; some were products of the workshops of famed jeweller, Fabergé and the famous Moscow silversmiths Khlebnikov and Ovchinnikov. Most of these ikons were gifts to the Imperial family from imortant monasteries, churches and religious organizations around the country and even from abroad. The backs of many of the ikons were inscribed with the subject matter, the giver and the date. When Nicholas and Alexandra lived in the palace there were fewer ikons than are seen in this photo taken before 1941. In Soviet times, when the palace was a museum, museum workers moved other ikons belonging to the family here from the children's rooms that were shut down by the government and turned over to Secret Police officers as private trysting rooms where they met their mistresses. Other ikons came from palaces where Romanov rooms were destroyed - such as the Winter Palace. In 1941 there were more than 300 ikons on the walls. There were two ikon lamps on the wall in the shape of doves. During the Imperial period, they were kept continuously lit with rose oil. Over the 21 years the scent impregnanted the fabric and very walls of the room. They were never extinguished until August 1, 1917, the day the Imperial Family went into exile. Twenty years after the Romanovs had been exiled from the palace visitors said the scent of roses was still overpowering. 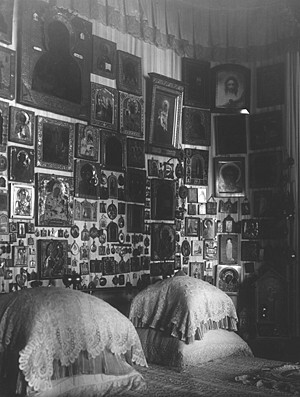 To the right of the bed Alexandra had a small prayer chapel with a bible and ikons set into the corner. A votive light was kept burning here as well. The Empress spent long hours here praying for her son, Aleksey, who suffered from hemophilia, and for the protection of her husband. She kept her candles and other religious supplies tucked away in cabinets in the chapel. Priests came to the chapel to hear the confession of the Tsar, Tsaritsa and their family in the bedroom. On the left side of the bed, in the corner behind surtains were installed a water closet made of wood with a porcelain bowl and wash stand. They were fully plumbed. These were kept covered and were seldom used, the empress had a separate bathroom installed in the next room, which was more convenient. Alexandra had problems sleeping and she was up much of the night - probably due to chronic worry. During the night she would nibble on fruit and crackers which was set out for her every night on a side table. They were awakened each morning by a servant at the door to the Mauve Room; on the other side a lackey would pound on the door with a silver mallet three times, a tradition started in the reign of Catherine the Great which continued up until the revolution. Nicholas was often up long before this - putting on his robe and crossing the corridor to his bathroom and dressing room. Alexandra was frequently late to rise. When she got up her ill health often meant that she went no further than the sofa in front of the bed. Above: A dressing table in Alexandra's bedroom. 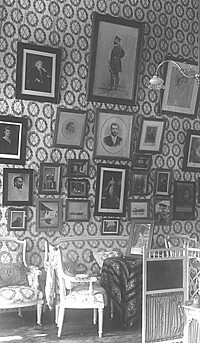 Right: The left wall showing family pictures. On the right wall of the room Alexandra had a collection of things she had brought back from a trip she had made to Italy with her brother before her marriage. This trip took her to Florence and she had a wonderful, carefree time. her brother took Alexandra to all of the famous landmarks - including the Uffizi Gallery. Alexandra also saw the convent of San Marco,and Fra Angelico's paintings there. The impressions she receieved on the trip deeply effected her and they continued to inspire her throughout her life. One day this trip wpould inspire parts of the new Livadia Palace in the Crimea which she and Nicholas built in 1912. While on the trip she purchased watercolors, copies of Della Robbia ceramics and a copy of a Bottichelli Madonna. This painting was one of the few things that followed the Imperial family into exile. It hung above the Empress' coach in Tobolsk. Alexandra had a vitrine near the two windows of the bedroom, which contained many of her Fabergé pieces, including some of the famous Easter eggs. Alongside was another cabinet containing gifts from her children. In 1941 the German Nazi Army and their Spanish allies occupied the palace. During their stay they made a sensational discovery. Where the arcade meets the bedroom wall they found a secret safe concealed beneath the fabric. During the 25 years the Palace had been a museum no one had found this secret hiding place. This is amazing considering the repeated numerous searches in the palace for Romanov treasures conducted by the Soviet Government over the years. Everyday the palace was open, thousands of people walked just a few feet from the secret safe, yet no one suspected its existence. Yet, the invading German army seemed to have known it was there. When the Soviet Army re-took the Palace they found the strong box in the wall, but it had been emptied. What did the Germans find in the vault? Was this a secret hiding place for Romanov jewels? No one has yet revealed the secret.